I’m a dew sweeper in the truest sense of the word. My first tee shot is typically struck before the sun rises and my goal is to walk off the 18th green three hours later to get back to my family. Living in Northern California this means cold, wet and frosty conditions in the winter and just slightly warmer conditions in the summer. Unfortunately the dew that I was sweeping always found a home on my lower pants legs resulting in cold, wet calves by the 3rd hole. Sure, rain pants would have been the logical solution, but, well they look like rain pants–black, boring and baggy, not to mention the breathability issue. There had to be a better option. That’s when I found J.Lindeberg pants. All three styles of J.Lindeberg pants (Troon, Trenton and Troyan) are made of H2Off fabric, which is water-resistant, breathable and virtually wrinkle-free. This means you’ll be dry, warm (but not hot) and you won’t have to visit the dry cleaners after the round. After wearing the Troon and Troyan styles for several years, my wife bought me a pair of the Trentons for Christmas, and these may be the best of the bunch. While the Troons are a slim-fit style and the Troyans provide a more generous straight leg style, the Trentons sit between the two–a classic, straight leg pant with a modern, fitted look. The Trentons also have some added style with button-down back pockets. I’ve worn these pants recently in a variety of conditions–everything from rain to sun with temps above 70 degrees–and Trentons performed admirably in all these conditions. They were water-resistant enough that I didn’t need to pull out rain pants during a downpour, and they breathed well in warmer temperatures. To me, these are the ultimate golf pants. The perfect mix between performance and style. The two biggest complaints I hear about J.Lindeberg pants are the price and the sizing. While the price is usually north of $130 USD, they are a tremendous value. I’ve had two pairs of Troons for seven years. I’ve easily worn both pairs over hundred times and they are still going strong. You can also find them on sale for under $100 USD. From a size standpoint, I find the Trentons to run true to size. 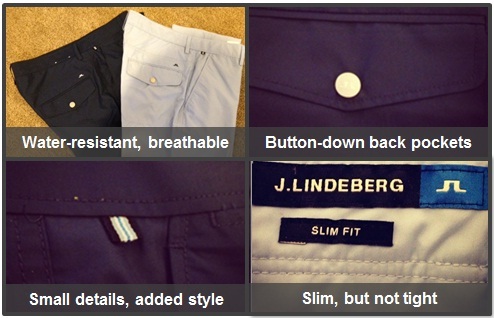 They are not the ultra slim-fit style that most golfers associate with J.Lindeberg apparel. You can usually find the Trentons, as well as the Troons and Troyans, at TrendyGolf.com, TrendyGolfUSA.com, FairwayStyles.com, JLindeberg.com, and JLindebergUSA.com.